British Airways has completed the major makeover of 18 of the airline’s iconic Boeing 747s to give them the look and feel of their newest aircraft. Each jumbo jet now features a refreshed interior and state-of-the-art in-flight entertainment system – as well as extra seats for customers flying in Club World. The first aircraft to be refreshed departed for New York, on the airline’s flagship transatlantic route, while the last one also goes back into commercial service tomorrow (August 4) as the BA117, flying customers from Heathrow to JFK airport. Troy Warfield, British Airways’ director of customer experience, said: “We have recently taken delivery of our 12th A380 super jumbo and have now have 13 Dreamliners in our fleet, however the iconic Boeing 747s remain an important part of our fleet, that many of our customers love. “We know customers who fly the revamped 747s really appreciate the improved interiors, with their mood lighting, better seating and new state-of-the-art in-flight entertainment system, making their flight just fly by. The refit means the aircraft cabin interiors are similar in look and feel to the airline’s newest aircraft, with 16 additional Club World lie-flat seats. 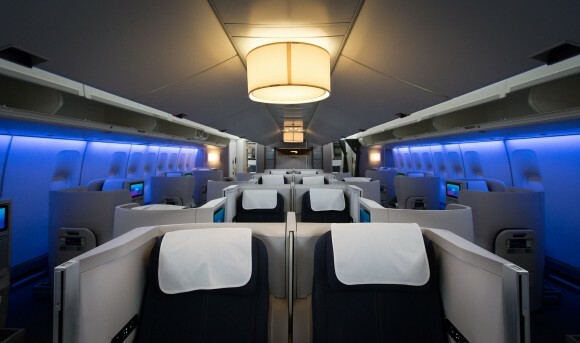 New carpets, seat covers and mood lighting have been fitted throughout each aircraft to match the new colour pallet of the airline’s new A380 and 787s, including new seat foams and new style seat covers in World Traveller and World Traveller Plus to increase customer comfort. All eighteen refreshed aircraft have also been fitted with Panasonic’s next generation eX3 entertainment system, which gives customers a choice of over 1,300 hours of entertainment including more than 130 movies and 400 TV programmes on larger, hi-resolution screens, capable of touch and swipe gestures, giving the system the familiar feel of using a tablet. Lightweight in design, the system from Panasonic Avionics Corporation helps to reduce the amount of fuel used by the four-engined Boeing 747s. The revamped jumbos now operate on selected flights to New York JFK, Chicago, Johannesburg, Dubai, Boston, Riyadh, Kuwait, San Francisco, Seattle, Toronto and Washington DC. British Airways has a fleet of 142 long-haul and 143 short-haul aircraft operating flights to almost 200 destinations around world.